Coming up with ideas and inspiration for our own lunch is hard. However providing lunch for our kids, who are often so fussy that it’s hard to find anything they want to eat, let alone eat healthily, is close to impossible. When packing a lunch for kids to bring to school it is important to ensure it is a balanced healthy meal but also one that they will eat. Providing the right balance of carbohydrate, meat/protein, fruit and vegetables and finally diary produce is important with an addition of an occassional treat where allowed. 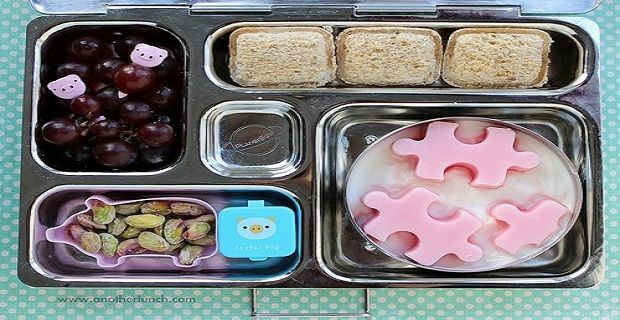 So here are a few ideas for making School lunches fun, healthy and loved by your kids! Getting fruit into kids can be difficult. But making it a bit more fun and exciting can make the difference between fruit being eaten at school and being left to rot at the bottom of the school bag. Turning fruit into exciting shapes (flowers, stars or any animals) or making a fruit skewer with a range of little fruit pieces will jazz up any lunch box! If kids prefer vegetables, carrot sticks with humus, sliced peppers or any other preferred vegetable in the lunch box will provided the required portion of their five a day. Creating fruit shapes is not the only way to jazz up the lunch box. Turning the plain cheese sandwich into an exciting cut out is a quick way to get your kids to start gobbling up those sandwiches and not have them returned home soggy and uneaten. You can buy a whole range of shape cutters, akin to pastry cutters, to make sandwiches into a whole range of fabulous shapes. Making sure the bread is wholemeal is the best option. And for kids who are just not into sandwiches substituting the bread for wraps, pitta breads or crackers can make a welcome change. Give your child some options around which meats or proteins they like – whether it’s ham, chicken or turkey or you prefer a non-meat source such as cheese or eggs allowing them to pick the contents of their lunch will help them feel a sense of ownership of their meal and are more likely to eat it. Ensuring a child has their adequate diary requirement is critical as kids are growing fast and need plenty of calcium to support it. For lunch time options yogurts, cheese or ensuring a drink of milk will add necessary calcium to the meal. If your school allows a small treat something such as a digestive biscuit, mini chocolate treat, popcorn or a carrot cake muffin or similar will go down a treat!. If your school is silent on treats it’s best to limit it to once per week maybe just on a Friday. Of course whatever you choose, presentation is everything. If you can make it look pretty and cool kids will be drawn in to eat it and be less concerned with what little healthy delights you are sneaking into them!